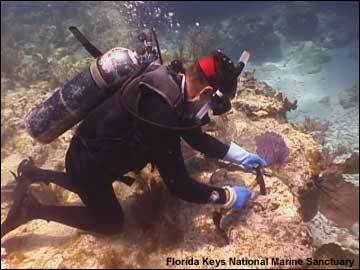 5) removing recreational mooring buoys from the work zone (These will be replaced once the restoration is completed). 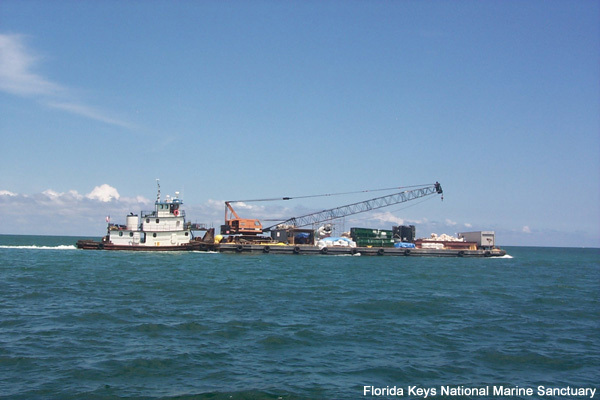 Weather delayed the work barge and both the installation of the mooring points and the loading of the barge in Port St. Lucie. A media and NOAA leadership site visit was scheduled for May 30th. The delay in the arrival of the work barge caused cancellation of the media componet of the trip. The media visit has been rescheduled for June 25th. 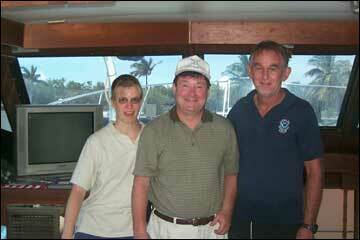 NOAA's new General Council, James Walpole was given a tour of the Wellwood restoration site. 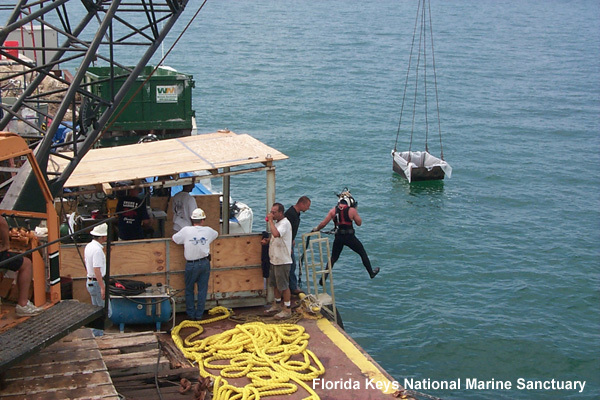 The final step of mobilization, the test pour of tremie concrete, was conducted May 31 by Underwater Engineering Services, Inc. The "test pour" took place on the storm anchorage location away from Molasses Reef to determine if there were any concrete mix or turbidity issues. Sanctuary biologist Harold Hudson, scarifying substrate for the transplantation of a Common Sea Fan. Click image for 300 dpi version. 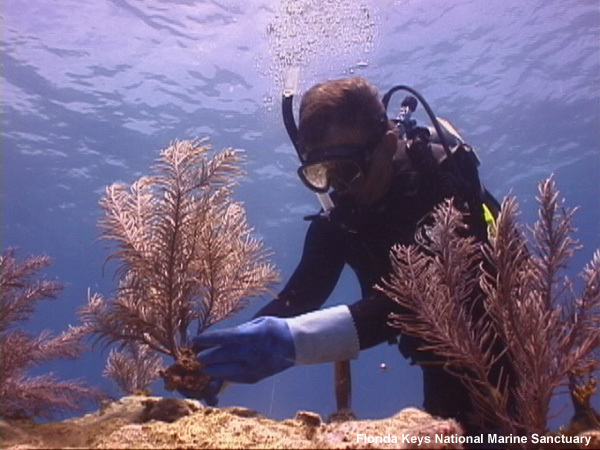 Transplantation of a Sea Plume. Click image for 300 dpi version. 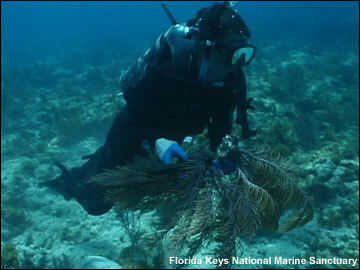 Moving several Sea Plumes to new locations on the grounding site. Click image for 300 dpi version. 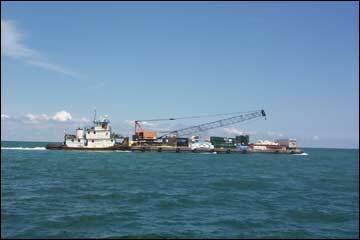 Contractor, Underwater Engineering Services, Inc. moves the construction barge to the Wellwood Restoration Site on Molasses Reef May 30. Click image for 300 dpi version. 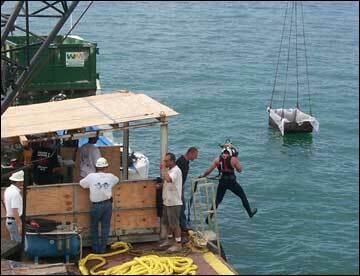 An Underwater Engineering Services Inc. diver is sent down to correctly place the concrete mixing tub on the bottom. This precautionary practice insures there is no damage to fragile marine resources and that the tub settles in a level position for the test pour of tremie concrete. Click image for 300 dpi version. 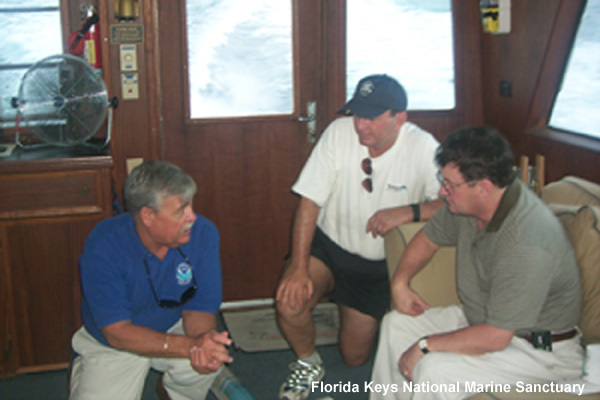 May 30, 2002 - Pre-site visit briefing by Billy Causey, Florida Keys National Marine Sanctuary manager, to Rick Spadoni, Coastal Planning and Engineering senior vice president and James Walpole, NOAA General Counsel. Click image for 300 dpi version. 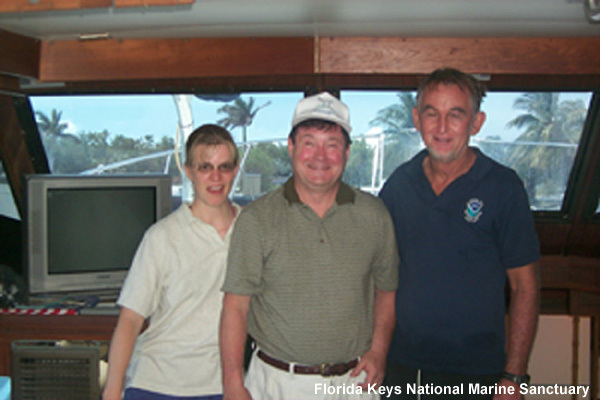 From left to right, Lisa Symons, National Marine Sanctuaries headquarters, James Walpole, NOAA General Counsel, and Harold Hudson, Sanctuary biologist and technical host for the pre-site visit. Click image for 300 dpi version.